In years past, I have had to work hard to engage people outside of the criminal justice system in the idea of criminal justice reform. No longer. The events in Ferguson, Missouri and Staten Island have pushed the topic of criminal justice onto the front pages of the papers. My neighbors and the parents of my kids' friends are suddenly interested in what I do for a living. That's good news. The bad news is that the public conversation about criminal justice has become increasingly heated and polarized. This presents challenges for an organization like the Center for Court Innovation. Almost all of our operating programs are predicated on the active cooperation of the justice system -- not just courts, but probation, prosecutors, defenders, and police. We also pride ourselves on our ability to do deep, intensive work alongside local residents and community groups in places like Crown Heights, Brownsville, Harlem, Newark, and Red Hook -- neighborhoods where there is a profound sense of distrust and disengagement with government. In other words, we want to work with both justice agencies and the communities that are most upset with justice agencies. This can be a delicate balancing act. As an agency, we are still trying to figure out how to navigate the current landscape. My hope is that when the public conversation starts to turn to solutions -- when people begin to ask, "How can we create stronger bonds of mutual engagement, respect, and accountability between justice agencies and the communities they exist to serve" -- there will be a great deal of interest in the kinds of work that the Center for Court Innovation does, whether it be our efforts to bring police and teens together, our work to reduce the use of jail, or our attempts to encourage justice agencies to treat defendants with dignity and respect. 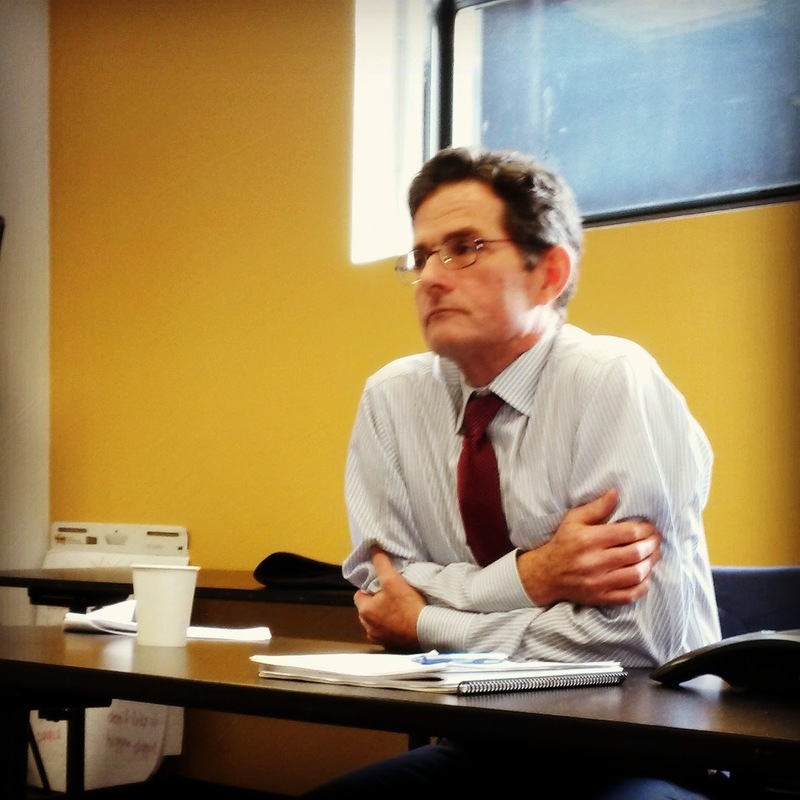 Last week, we had federal judge John Gleeson (see photo above) come to speak at our midtown headquarters. Gleeson spoke eloquently about his efforts to change sentencing practice in the federal courts and to reduce the use of incarceration in particular. He may just be an extraordinarily gracious man, but Gleeson also talked about how he has drawn inspiration from some of the reforms that the Center for Court Innovation has helped to pilot in the state courts, including the Red Hook Community Justice Center. Judge Wants to Overhaul NY's Bail System -- A WPIX report on New York State Chief Judge Jonathan Lippman's efforts to reduce pretrial detention, including the first-ever coverage of Brooklyn Justice Initiatives, our new supervised release program in Kings County. Community Courts and the Future of the Criminal Justice System -- Pacific Standard reports on the Red Hook Community Justice Center and the importance of procedural justice. The Conservative Case for Reforming the Police -- Slate discusses the existence of a vibrant right-wing criminal justice reform movement, argues for a more localized approach to justice, and highlights our work in Red Hook.